The cows will stay, but the hikers will also have their day. 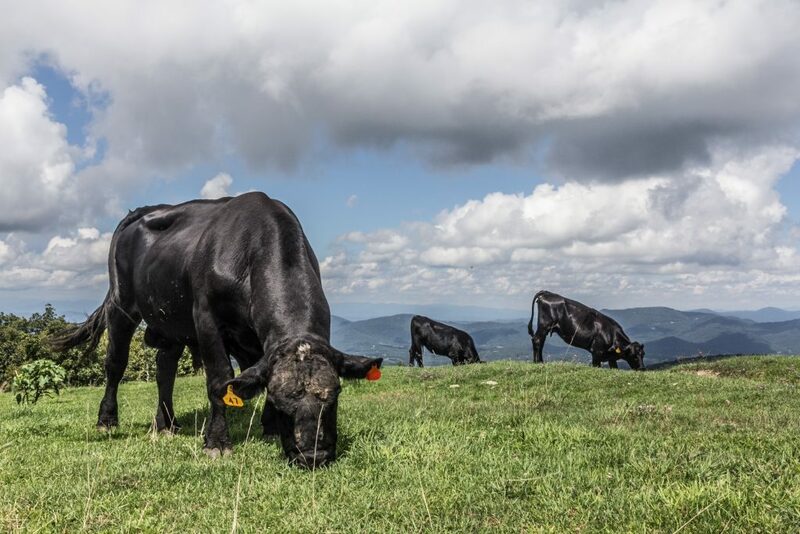 The well-known herd that grazes the slopes of the iconic Bearwallow Mountain on the Henderson-Buncombe county line in Hickory Nut Gorge will continue to roam and share the beloved mountaintop with hikers, now that the entire summit has been placed in permanent conservation. 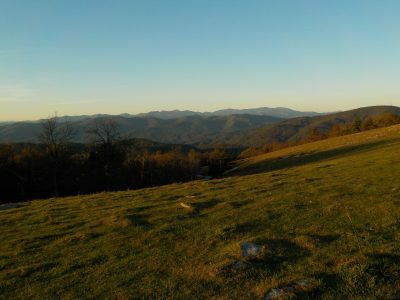 In the works for eight years, the Lyda family of Henderson County and Conserving Carolina have settled on a deal to protect 476 acres on the Bearwallow Mountain summit. The family placed a conservation easement with the land trust, ensuring they would be able to continue grazing their cattle as they have since the 1930s while the property is open to the public for hiking and the land and expansive views protected forever. “It is going to be a treasure for anyone that ever visits that mountain. The views are incredible. Even a couple of houses built there would change the whole character,” said Ryan Lubbers, a naturalist with the Chimney Rock Park LLC, who also created a topographic map of hiking trails in the gorge. For the last 100 years, people did hike across the mountain but followed a cow trail. 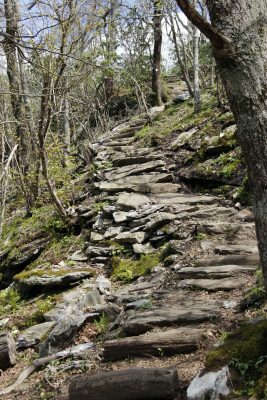 In 2011, the Carolina Mountain Club at the request of Conserving Carolina built a one-mile trail to the 4,232-foot summit along switchbacks and through rich cove and old growth forest to the summit. Now hikers will be able to continue from the trail across the wide open pasture with nearly 360-degree, Instagram-worthy views from the Black Mountains to the north and downtown Hendersonville and the lowlands of South Carolina to the south, and continue on a soon-to-be-built, two-mile trail connecting to Little Pisgah Mountain to the east. It’s rare that a family would put land into conservation and allow for public access, said Kieran Roe, executive director of Conserving Carolina, a land trust created by the merging of the former Carolina Mountain Land Conservancy and the Pacolet Area Conservancy. The Lydas will continue to own and live on the land, which has been in the family for generations. The conservation easement, settled for an undisclosed amount, was funded through the state Clean Water Management Trust Fund and matched by a contribution from philanthropists Fred and Alice Stanback of Salisbury. “My dad loved the mountain. He never wanted to sell,” Nancy Lyda said in a statement. Her father, George Barnwell, passed away in 1999. In 2007, Henderson County approved Grand Highlands, an upscale development near the mountain. Pearl Barnwell died in 2013, and her son, Henry, who worked on the first two phases of conservation, died in 2014. The family assets were passed to his sister, Nancy Lyda, and her three children. 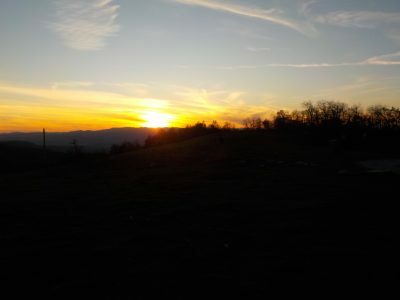 The family placed a conservation easement on 81 acres at the peak of the mountain in 2009 and gave the conservancy an option to add more acres to the conservation area as money was raised. 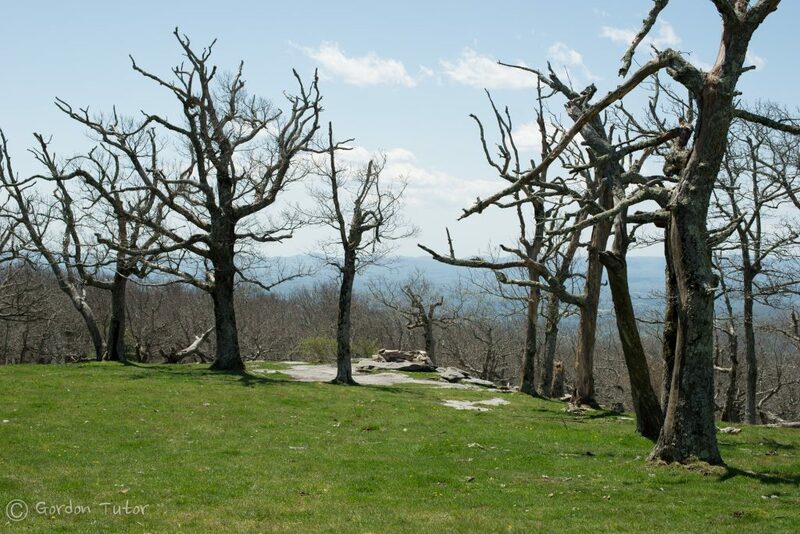 A second phase of the easement was completed in 2012 on 89 acres west to Bearwallow Gap, where the popular Bearwallow Mountain trailhead is located. At the request of Conserving Carolina, in 2011 Carolina Mountain Club built the trail to the summit, which the club’s Asheville Friday Trail Crew leader Skip Sheldon said is moderately difficult. “It’s an ideal combination. The trail is very walkable. It has a gradual enough climb, it’s very doable for people of all abilities, and for children. The view is spectacular. The fire tower adds an element of interest as well. We’re very proud of the trail,” Sheldon said. Apparently, area hikers are proud of it as well. On any given weekend, the nonexistent parking area (just the sides of Bearwallow Road off U.S. 74A in Gerton) is overflowing. It sits across the road from the newly completed, five-mile roundtrip Trombatore Trail. Having another hiking option will be welcome, Sheldon said. 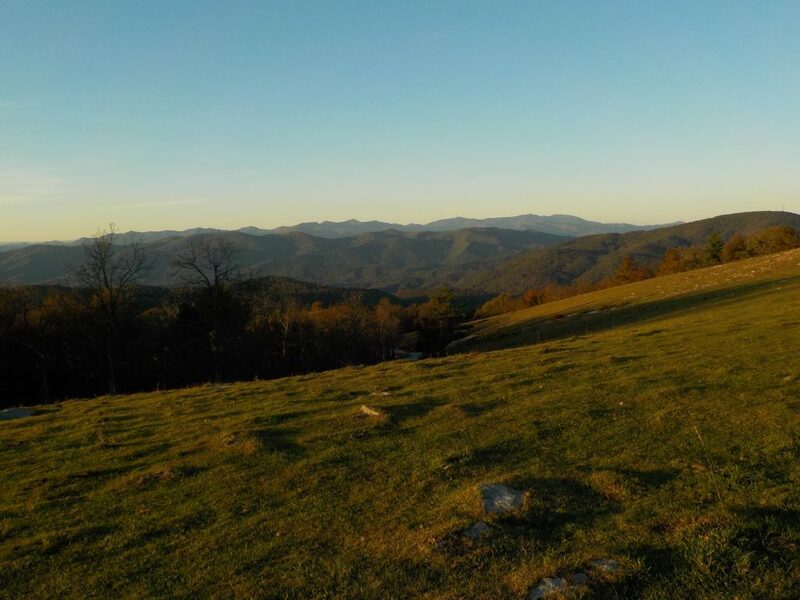 This year the Lyda Family conveyed a third and final conservation easement on 306 acres east of the Bearwallow peak to Little Bearwallow Mountain, bringing the total conservation area on the mountain summit to 476 acres. The “Where the Bear Wallows Trail” will one day traverse the newly conserved tract, connecting on the existing Bearwallow Mountain Trail to the just complete Wildcat Rock Trail, said Peter Barr, Conserving Carolina Trails Coordinator. A trail contractor will break ground on the two-mile trail next summer to fall and will open by the end of 2019, Barr said. It will be funded by an already-awarded Recreational Trails Program grant from the state Trails Program as well as private donations. “The name of the trail is derived from the wet seep/pond in the saddle between Bearwallow Mountain and Little Bearwallow Mountains, located in the center of the newly conserved tract,” Barr said. He said the trail segments will eventually make up a 100-mile Upper Hickory Nut Gorge Trail. The hope is that the trail will link the 600-acre Florence Nature Preserve east of Gerton, to hundreds of acres protected by the Southern Appalachian Highlands Conservancy around Hickory Nut Gap to Chimney Rock State Park and Lake Lure park lands. The land is valuable not only for hiking but for its 73 acres of old growth forest, protection of water quality and the wildlife, Roe said. Seven rare natural communities have been documented, including Southern Appalachian Bog. At least 387 species have been observed, including 249 plant and 38 wildlife species. The ridges contain suitable habitat for at least 14 rare species listed by the state of North Carolina including three plants and11 wildlife species such as the green salamander, cerulean warbler, eastern small-footed bat and eastern spotted skunk. The Lydas set aside a 2.43-acre tract for a future cabin site for Nancy’s three children, Tammy Lyda, Jeff Lyda and Jenni Frady, and two grandchildren. Lubbers said people should keep a healthy distance from the cows continuing to come nearly nose to nose with these hikers and picnickers, especially when coming between a mama cow and calf, and hikers should keep their dogs on a leash. But they should thank the cows. “It really creates a different atmosphere with wide open views,” he said. “Without the cows, it will become all grown over with forest. It’s a unique place.